Contest and Exclusive Interview with Seth Grahame-Smith! I recently had the honor of interviewing Seth Grahame-Smith, the author of the bestselling novel Pride and Prejudice and Zombies. 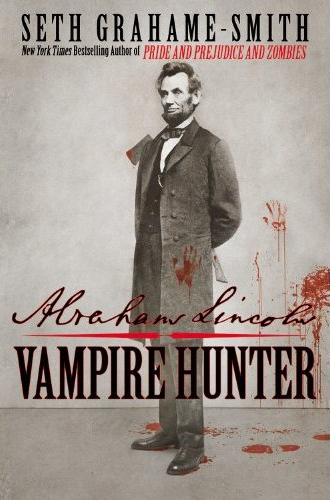 Seth has a kickass vampire book coming out (which I wrote about here) titled Abraham Lincoln: Vampire Hunter. Not only do you get a short interview but we’re also having a contest, if you want to enter in to win a copy of the new book check out the details at the bottom. Why Abraham Lincoln? Why vampires? A couple of years ago, it seemed like every new book that came out was either a Lincoln biography or a steamy vampire romance. It was one of those “hey, what if I put chocolate and peanut butter TOGETHER! ?” moments. The idea of Honest Abe swinging his ax at vampires began as a fleeting little thought in a bookstore. But it was an idea that wouldn’t go away. The more I researched Lincoln’s actual life (and it was an unbelievably tragic, epic life), the more I saw opportunities to weave in the walking dead. Who would win in a fight? A zombie, a vampire or a werewolf? Well, you have to take zombies right out of the equation – right off the bat. I mean, they’re terrible fighters. Vampires have the edge in terms of intelligence (especially if they’ve been around a few centuries), and they’re extremely hard to kill since they’re technically already dead. Werewolves, on the other hand, probably have the edge in terms of sheer strength, but they’re blinded by rage (i.e. rabies). It’d be a close fight, for sure – but I’m going to go with vampire. They’re just cooler. What is the last book you read? Would you recommend it? Truman by David McCullough, and yes. Via Twitter I have learned that a most authors have certain music that they write to. Do you listen to music while writing, and if so what music? I mix it up, but yes – I almost always write with headphones on and music blaring. Some of the staples over the last year or so: Thomas Newman scores, James Newton Howard scores, Jerry Goldsmith scores, Ulrich Schnauss, Air, Boards of Canada, I Love You But I’ve Chosen Darkness, My Bloody Valentine, Jonny Greenwood, Nine Inch Nails, and so on. THE CONTEST: It’s pretty simple, all you have to do is send us an e-mail at contest@darkness.com with the title “ABE LINCOLN CONTEST” and tell us why you want the book. See how easy that is? The contest ends February 28, 2010 so submit your entries soon! 5 winners will be picked at the beginning of March. Cillian Murphy moving to A QUIET PLACE?